On Wednesday, February 13th, the biggest names in athletics will return to Athlone Institute of Technology to compete in its sixth International Grand Prix. World Indoor silver medalist Su Bingtian will be headlining the event alongside Olympic champion pole-vaulter Thiago Braz and former European Champion and current World Indoor medalist Marcin Lewandowski. Dubbed ‘Asia’s fastest man’, Bingtian is the first Asian-born sprinter to break the sub-10-seconds barrier in the 100 meters. The 29-year-old, set to compete in the men’s 60 meters, will be looking to impress ahead of his bid for the 2020 Olympic Games in Tokyo. Meanwhile, Irish athletics superstar and senior record holder Thomas Barr will return to defend his 400 meter title against British talent Jacob Paul and Luke Lennon-Ford, the Netherlands’ Tony van Diepen and Portuguese sprinter Ricardo Dos Santos. The Irish Olympian, who set a new national record of 47.97 in Rio in 2016, is the crowd favourite to win the race. European medalist Ciara Mageean, who narrowly missed out on a bronze medal in the European Championships in Berlin, will take on Olympian Genevieve LaCaze, Romania’s Claudia Bobocea, Irish athlete Sarah Healy and others in the women’s 1500 meter. Rising talent Sarah Healy stormed the European Athletics U18 Championships 3000m in 2018 and previously smashed Ciara Mageean’s Irish senior girls 1500m record with a time of 4:18.32 at the All-Ireland schools track and field championships. The men’s 800 meters also promises to be an exciting event with strong Irish interest in the form of Mark English and Zak Curran. The two Irish contenders will be pushed to their limits as they take on 2017 World Championship 4th placer Kyle Langford and 1:44 athlete Erik Sowinski. The field will be rounded out with Daniel Andujar (1:45.17 PB) and Australian middle-distance runner Jordy Williamsz (1:46.77). In the men’s mile, Irish athletes Paul Robinson, John Travers and Kieran Kelly will take on Ryan Gregson (3:55.97 indoor PB) and Stewart McSweyn (3:54.60 mile outdoors) the latter of which won the Birmingham Diamond League in 2018 and set a personal best in the 1500m, one mile, 3000m, 5000m and 10000m. Thiago Braz will be looking to return to his best having won Olympic gold in the pole vault on home soil in Rio 2016. He will take on young high-flyers in the form of 2018 European U18 Champion Pål Lillefosse, 2018 Commonwealth Games 4th placer Adam Hague and Finland’s Tommi Holttinnen who placed 7th in the 2017 Euro U23 Championships. 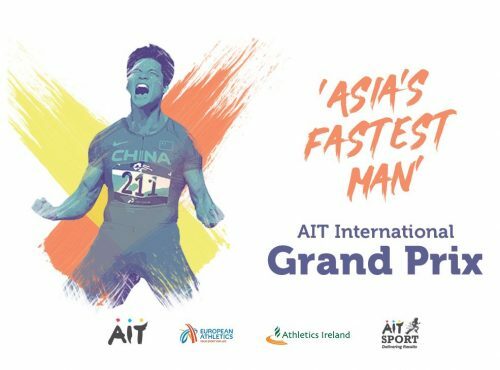 Over the past five years, the AIT International Grand Prix has attracted world-class athletic talent, including now-retired World and Olympic athlete Ashton Eaton and international stars Mutaz Essa Barshim, Carmelita Jeter and Asafa Powell. It has also seen six stadium records broken, putting Athlone Institute of Technology and its ‘fast track’ on the international athletics map. In 2018, former AIT Sports Scholarship recipient John Travers made Irish athletics history becoming the first Irish man to run a sub-four-minute mile indoor on home soil (3.59.40). The atmosphere in the International Arena was electric as the Dublin man raced across the finish line taking third behind Ryan Gregson of Australia (3:57.86) and Poland’s Grzegorz Kalinowski (3:59.19). Always a crowd pleaser, Thomas Barr thrilled his fans with a come-from-behind victory in the final 40 meters of a brilliant 400 meters men’s race. The Irish athlete was the only competitor to dip under the 47-second barrier – an amazing feat for a 400m hurdles specialist. Barr was fulsome in his praise of the ecstatic sell-out crowd whom he credited with helping him overtake Ricardo Dos-Santos of Portugal in the home straight. In 2017, Olympic Champion Sally Pearson used the competition as a springboard to relaunch her career after a serious injury. While the Australian athlete only came in third (after Christina Manning’s stunning 7.8 victory – a stadium and an all-comers record), she did progress to the World Outdoor Championships in London where she later claimed gold. The previous year, novel additions, such as the Pole Vault event, attracted world champions, Shawn Barber and Sam Kendricks, who battled it out with the latter achieving a best jump of 5.77m – a stadium record. That same year, Barber’s compatriot Melissa Bishop smashed the women’s 800m race in a time of 2.00.60. Most memorable of all, however, was Ethiopia’s Dawit Wolde who dominated the men’s mile while simultaneously breaking the Ethiopian indoor 1500m record with a time of 3.37.86.